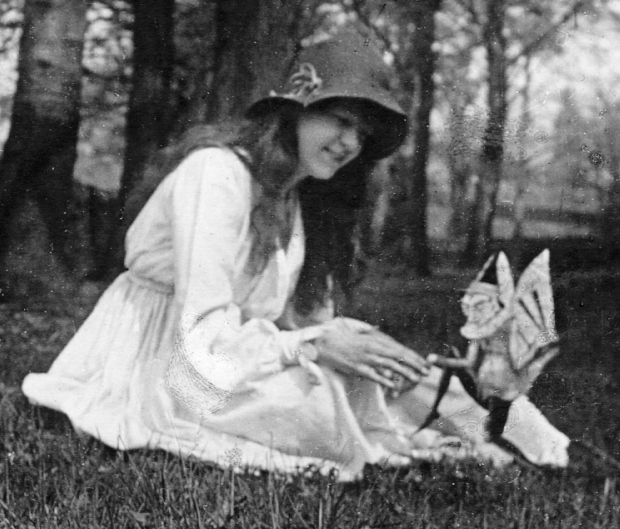 The reason that Conversations with Spirits was set in 1917, is that that was the year that Arthur Conan Doyle came out in support of the Cottingley fairy photographs. The final years of the Great War were a heyday for so-called ‘spirit photographs’. The Spiritualist movement fed the insatiable hunger of the war bereaved, and a new breed of ‘psychic photographer’ made a good living by exploiting the grieving by producing portraits with ghostly images of lost loved ones hovering in the background. These ‘spirits’ were just double exposures on the same photographic plate, of course - but this was at a time when photography was fairly new and not well understood. Largely as a result of this type of photographic trickery, many Spiritualists began to believe that the camera could ‘see’ things that the naked eye could not. It was this belief which would help legitimise the Cottingley fairy photographs. Cottingley is a small village just outside Bradford in Yorkshire. It was here that 16-year-old Elsie Wright took some remarkable photographs of her ten-year-old cousin, Frances Griffiths, playing with ‘fairies’ on the banks of a stream which ran behind the garden of Elsie’s house. Sir Arthur Conan Doyle heard about the pictures at a time when he was preparing an article about fairy sightings for The Strand magazine. By this stage in his career, Conan Doyle had already fallen out of favour with much of his reading public, since he had virtually given up writing fiction and now devoted his time to promoting the Spiritualist cause. The Christmas edition of The Strand ran with the headline: ‘Fairies Photographed - An Epoch Making Event Described by A. Conan Doyle.’ Inside, the picture of ‘Iris and the Dancing Gnome’ was captioned as ‘one of the most astounding photographs ever published’. Doyle concludes by stating that he has examined the photographs himself ‘long and earnestly’ with a high-powered lens - and that there was a strong case authenticity of the pictures. The Christmas edition of The Strand sold out across the country in three days. Conan Doyle had hoped that his article would cause a sensation, and provide a paradigm shift within the scientific community, which might ultimately change their ‘closed’ view of the world. However, the reaction it actually received was mainly one of disbelief. The British public struggled to understand how a man like Conan Doyle could go from writing the Sherlock Holmes novels to now writing - apparently seriously - about the existence of fairies at the bottom of the garden. Yet, in actual fact, fairies had been a fixture in Doyle's family all his life. Doyle’s father – Charles Altamont Doyle – was committed to a lunatic asylum in 1881, where he spent his days sitting alone, filling the pages of his sketchbook with pictures of fairies, goblins and sprites. Richard Doyle, Arthur’s uncle, actually made his reputation with fairy paintings. He even famously designed the cover of Punch Magazine, the logo of which featured pictures of fairies. Though he grow up in Scotland, Conan Doyle’s roots were Irish and (according to his letters) he grew up listening to his mother’s tales of fairies, leprechauns and ‘little people’. Moreover, Doyle’s fanatical need to prove Spiritualism was ‘real’ was probably made more urgent by the fact that he was (like most of the country, we can assume) grieving. The Great War had robbed him of his son, Kingsley, his brother, Innes, and his two brothers-in-law (including E. W. Hornung - the creator of the Raffles books). Also, despite his skill as a doctor and the advantages of a considerable personal fortune, Doyle had also lost his wife, Touie, to tuberculosis. As a direct consequence of his bereavement, Doyle began to spend more and more time at séances and in the company of psychic mediums, attempting to contact his loved ones - which, we can assume, he did. Doyle became a public supporter of Spiritualism in 1917 – claiming he had spent more than thirty years weighing up the evidence. In 1922, Doyle published a book on the Cottingley case. The Coming Of The Fairies was released to considerable public ridicule. Conan Doyle - who always seemed remarkably unmoved by attacks on his character and beliefs – was undaunted and carried on promoting the idea of fairies, even touring around the world lecturing on the subject. Doyle died in 1930, still believing that the photographs represented proof that fairies exist - and, with it, a larger supernatural world, which was being denied by modern science. Elsie Wright and Frances Griffiths stuck to their story for years, as the debate about the pictures’ authenticity raged on. It was not until 1983, that Frances finally confessed that the ‘fairies’ had been pictures copied from a storybook and propped up by hatpins. The fact that the ‘fairies’ are (bad) drawings seems fairly self-evident when viewed by a modern audience. But, then again, most of us have a stability in our lives that was lacking in Doyle’s - which means our need to believe in them isn’t nearly as strong.